Muhammad Ali Pasha – whom many consider the father of modern Egypt for his numerous, enduring, modern reforms – commissioned this mosque to be built in 1830 in memory of his son. Construction took over twenty years. 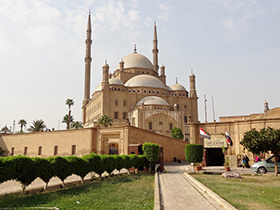 It was intended originally to serve as the national mosque for a newly quasi-independent state of Egypt. It is today one of the first buildings visible when approaching Cairo from any direction. In 1899, the mosque began to show serious signs of disrepair, but a full renovation did not begin until 1931, and did not finish until 1939, during the reign of Muhammad Ali’s ninth and penultimate successor, King Faoruk I.